Collins Dollies and Collins Dolly Parts. 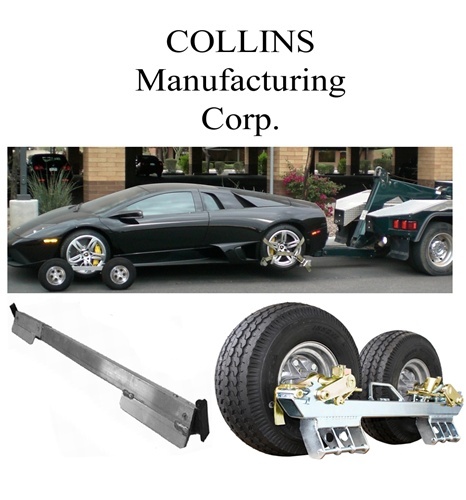 Tow Dollies From Collins Manufacturing Corp. for Towing and Recovery. Self-Loading Dollies are great tool to preventing damage to your valuable cargo. Use dollys on cars and trucks with flat tires, bent rims, 4x4's, all-wheel-drive vehicles, and cars that are in-gear or have the parking brake applied. Dollys can also prevent damage to exhaust, front spoliers, body kits, exhaust pipes, and lowered vehicles. Collins Dollies are the lightest in the industry.